1Rice Research Institute, Shandong Academy of Agricultural Sciences, Jinan, 250100, China. To date, information regarding the effects of Si on rice (Oryza sativa L.) nutritional quality is rarely reported. The current study was conducted to evaluate how Si fertilizer impacts the mineral element, protein and amino acid concentrations in brown and milled rice. The experiment was a randomized complete split-plot design, with Si treatments as main plot and two cultivars as subplot. Compared with the control, application of Si fertilizer significantly enhanced the Zn, Ca and Mg concentrations in brown and milled rice but had nonsignificant effects on the Fe, Mn and Cu concentrations. Moreover, application of Si fertilizer resulted in significant increases in the concentrations of protein and most of the amino acids in brown and milled rice. However, the Gly, His, Val, Met and Lys concentrations were unaffected by the application of Si. The responses of the Cys and Phe concentrations to Si fertilizer application were cultivar-dependent. Applying Si significantly increased Zn, Ca, Mg and protein concentrations by 21.77%, 25.77%, 7.25% and 6.19% in milled rice and by 25.18%, 39.81%, 9.24% and 5.52% in brown rice. These results indicate that Si fertilizer could improve rice nutritional quality by increasing concentrations of mineral elements, protein and some amino acids in brown and milled rice. In general, mineral elements, such as Fe, Cu, Mn, Zn, Ca and Mg, are indispensable to the human body as they play important roles in controlling immunological function in adults and intelligence development in children (Belder et al., 2005; Boonchuay et al., 2013). Insufficient intake of these mineral elements from food results in the impairment of human health, such as the occurrence of anemia (Shan, 2006). It has been reported that approximately one-third of the world's population suffers from Fe and Zn malnutrition, a problem that is particularly severe in developing countries (Boonchuay et al., 2013). As a staple cereal crop, rice (Oryza sativa L.) provides not only carbohydrates but also protein, vitamin and mineral nutrition for more than half of the world's population. Therefore, efforts should be made to enhance the mineral element concentrations in milled rice in rice-consuming countries, particularly those that are also developing countries. Previous studies have demonstrated that some mineral elements are abundant in the rice aleurone layer and embryo but less so in the endosperm (Bouis and Welch, 2010; Wei, et al., 2012a). Unfortunately the form of rice most commonly globally consumed is milled rice, which endosperm with the aleurone layer and embryo removed. Milled rice is rich in starch but lacks adequate nutritional components such as Fe and Zn (Bouis and Welch, 2010). It is well known that the concentrations of mineral elements in milled rice are determined by both genotype and cultivation conditions, such as climate, fertilizer, and water conditions (Yang et al., 1998; E et al., 2005; Yuan et al., 2006). Therefore, it is important to ameliorate the mineral concentrations in milled rice through breeding programs and agronomic approaches. Some screening studies have identified Fe- and Zn-dense genotypes with the aim of enhancing the mineral nutrition concentrations in milled rice (Sperotto et al., 2012; Wei et al., 2012a). Previous studies have also investigated the effects of fertilizer on the mineral element concentrations in milled rice, including the effects of fertilizer type, application pattern and application amount (Zhang et al., 2007; Wei et al., 2012a; He et al., 2013). Yuan et al. (2006) reported that the optimal application of N fertilizer in paddy fields was instrumental in the accumulation of Fe, Cu, Mn, Zn, Ca and Mg in milled rice. E et al. (2005) that an increase in the amount of P fertilizer applied enhanced the Mg concentration in milled rice and that a rational application of K increased the accumulation of Fe, Zn, Cu and Mn in milled rice. Boonchuay et al. 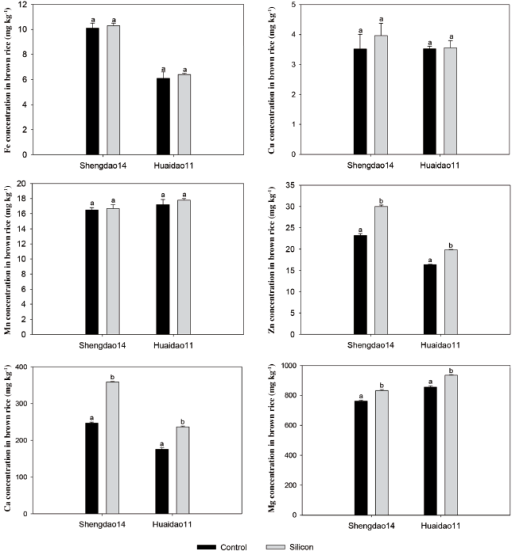 (2013) confirmed that the Zn concentration of rice grains could be effectively increased by foliar application of ZnSO4·7H2O after flowering. Similar results were reported by Wei et al. (2012b), who found that ZnSO4 and Zn-amino were highly effective foliar Zn forms for increasing the accumulation of Zn in milled rice. He et al. (2013) reported that foliar diethylenetriaminepentaacetic acid (DTPA)-Fe application increased cysteine and mineral concentrations, including Fe, Ca, Cu, Zn and Mn. Since the positive effects of Si amendment on plant growth were established, the influences of Si on the development of rice plants have been extensively studied (Mitani et al., 2005; Nwugo and Huerta, 2008). Currently, Si is ranked as the fourth most important element for rice production in rice-growing countries of southeast Asia, following N, P and K (Gong et al., 2012). Silicon, which is mainly absorbed by the roots in the form of silicic acid (H4SiO4) and is distributed extensively throughout rice plant tissues, can effectively stimulate the growth of rice plants (Hossain et al., 2002). Silicon contributes to the components of the tissue cell through its involvement in the regulation of physiochemical metabolism in rice plants (Hossain et al., 2002). Several beneficial effects of Si on plants have also been demonstrated, such as the enhancement of photosynthesis, grain yield and plant tolerance to biotic (plant diseases and pests) and abiotic stresses (e.g., physical injury, drought stress, high temperature stress and salt stress) (Ma, 2004; Chen et al., 2011; Kim et al., 2014). Furthermore, Si fertilizer can increase the milling and eating qualities of rice by increasing head rice yield and the breakdown value of the Rapid Viscosity Analysis (RVA) profile (Zhang et al., 2007). Considering the contribution of Si to rice grain yield and quality, Si is now considered as an important determinant in rice production (Gong et al., 2012; Meharg and Meharg, 2015). However, to the best of our knowledge, whether the application of Si can effectively improve the nutritional quality of rice is rarely reported, especially the changes in mineral elements, amino acid and protein concentrations of grains. The objective of the present study was to evaluate the effect of Si fertilizer on the nutritional quality of milled rice, specifically in terms of the amino acid, protein, and mineral element (Fe, Zn, Cu, Mn, Mg and Ca) concentrations. The experiment was conducted at Jining Experimental Station (35°57' N, 117°36' E) of Rice Research Institute, Shandong Academy of Agricultural Sciences, in 2013 and 2014. The soil type of the experimental site was typical clay loam. Measured chemical properties of the experimental soil prior to fertilizer were as follows: pH 7.8, organic matter 23.55 g kg-1, total N 1.09 g kg-1, available N 54.29 mg kg-1, available P 40.63 mg kg-1, available K 146.50 mg kg-1, and available Si 150 mg kg-1. The experiment used a split-plot design with three replicates. The main plots were subjected to two different Si fertilizer application treatments (90 and 0 kg ha-1). The sub-plot included two common local japonica rice cultivars, 'Shengdao14' and 'Huaidao11'. To avoid the movement of water and fertilizer between the two Si application treatments, the main plots were separated by a 50-cm-wide ridge with plastic film inserted into soil to a depth of 30 cm. Liquid Si fertilizer (80% H4SiO4, fertilizer limited corporation, Shandong, China) was applied twice by spraying to the surface of soil for corresponding plot at intervals of 5 d, with the first application at rice booting stage. Rice seeds were uniformly sown on May 18 and transplanted into a paddy field on June 26 in both study years. The size of each plot was 25.9 m2 with a row space of 30 cm and a hill distance of 12 cm, with four seedlings per hill. Each plot received standard agronomic practices commonly performed in local production. Rice grains from each plot were harvested at maturity. Then, they were dehulled by a dehusker (made in Korea) to obtain brown rice and milled by a rice polisher (made in Korea) to obtain milled rice. Grains from each plot were divided, with half remaining brown and half being milled. Subsequently, the brown and milled rice samples were ground into powder using a flour mill, sieved through a 100-mesh sieve, and divided into test samples for the chemical assays. Concentrations of mineral elements Fe, Cu, Mn, Zn, Ca, and Mg were assayed according to the method of the National Standard of People's Republic of China (GB/T 5009.90, 2003; GB/T 5009.92, 2003) and the Standard of Ministry of Agriculture of People's Republic of China (NY-861-2004). An inductively Coupled Plasma Optical Emission Spectrometer (Optima 5300DV, Perkin Elmer, Waltham, Massachusetts USA) was used to determine the concentrations of mineral elements in samples. The crude protein concentration was assayed using a nitrogen analyzer (AutoKjeldahl Unit K-370, Büchi Labortechnik, Flawil, Switzerland) according to Approved Method 46-30.01 (AACCI, 2010) using a N conversion factor of 5.95. A full-automatic amino acid analyzer (L-8800, Hitachi Limited Corporation, Tokyo, Japan) was employed to measure the amino acid concentrations following the standard sample digestion method of the National Standard of People's Republic of China (GB7649-87, 1987). For all parameters, there were nonsignificant differences in data across 2 yr study and in interactions Years × Cultivars, Years × Treatments (Tables 1-7). Therefore, data were analyzed as the means over the 2 yr study using SPSS 11.5 (SPSS Inc., Chicago, Illinois, USA). The least significant difference (LSD) test was used to compare treatment with control means at the p = 0.05 probability level. Relationships between the mineral element concentrations and the amino acid concentrations in milled rice were assessed using Pearson correlation analysis. Figures were plotted using Sigmaplot 10 (Systat Software, San Jose, California, USA). Table 1: P values from the ANOVA of the main effects of cultivars, treatments, years, and their interactions on mineral elements concentrations in milled rice. NS: Nonsignificant difference at p < 0.05 level. Silicon, the second most abundant element in soil, plays a crucial role in regulating plants development, particularly for Si-accumulator crops (Yamamoto et al., 2012; Meharg and Megarg, 2015). How Si fertilizer impacts mineral elements concentration in rice grains is still poorly understood. Accordingly, we investigated the relationship between the application of Si fertilizer and the changes in mineral elements of rice grains under field condition, which is of great significance. In the current study, Si fertilizer application significantly enhanced the Zn, Ca and Mg concentrations in brown and milled rice for both cultivars but had no apparent effect on the Fe, Mn and Cu concentrations in either (Figures 1 and 2). In 'Shengdao14', the application of Si fertilizer markedly increased the Zn, Ca and Mg concentrations of milled rice by 32.97%, 29.92% and 7.89%, respectively. In 'Huaidao11', Si application markedly increased the corresponding mineral elements by 10.56%, 21.61% and 6.61%, respectively. Similar results were observed in brown rice (Figure 2). In 'Shengdao14', Si fertilizer markedly increased the Zn, Ca and Mg concentrations in brown rice by 29.17%, 45.08% and 9.17%, respectively. In 'Huaidao11', the corresponding mineral elements were markedly increased by 21.18%, 34.54% and 9.31%, respectively. The results suggest that Si impacted the accumulation of other mineral elements in milled rice and that the effects were more pronounced in 'Shengdao14' than in 'Huaidao11'. Different letters between treatments within the same cultivar indicate a significant difference at p < 0.05. Figure. 1: Effects of Si fertilizer on mineral elements concentrations in milled rice. Figure 2: Effects of Si fertilizer on mineral element concentrations in brown rice. Past report showed that the application of Si inhibited the absorption of Fe and Mn, thereby leading to the significant reduction of Fe and Mn concentrations in rice plants (Islam and Saha, 1969). Interestingly, in the present study, the treatment of Si application did not exert significant influence on Fe and Mn concentrations of brown and milled rice when compared with control (Tables 2 and 3). We speculate that Si could alter the distribution ratio of Fe and Zn among different plant organs and promote their transportation to grains through phloem, which maybe the reason for the insignificant difference (Grusak, 1994; Xing and Zhang, 1998). Additionally, it is notable that the Ca and Mg concentrations in brown and milled rice were significantly enhanced after the application of Si fertilizer, suggesting the beneficial effect of Si on some mineral elements accumulation in rice. The result may be associated with the promotion in absorption of Ca and Mg elements in rice plants resulting from Si application (Islam and Saha, 1969). Moreover, the transportation and allocation mechanism of mineral element in rice under Si application should be further investigated in future, which can aid in fully understanding the function of Si for determining rice nutritional quality. Table 2: P values from the ANOVA of the main effects of cultivars, treatments, years, and their interactions on mineral elements concentrations in brown rice. Table 3: P values from the ANOVA of the main effects of cultivars, treatments, years, and their interactions on protein concentration in milled and brown rice. The protein and amino acids concentrations of milled rice are important parameters for evaluating the nutritional quality of rice; the concentrations of essential amino acids are particularly important as these amino acids cannot be synthesized by the human body (Wang et al., 2007). The protein in milled rice is more readily digested and absorbed by human body than is the protein of any other cereal. The biological value of protein in milled rice typically ranges from 74-75, which greatly exceeds the corresponding values for wheat and corn (Wang et al., 2007). As a result, milled rice has been identified as an excellent plant protein. It has been verified that, in addition to genotype, cultivation conditions are also pivotal factors affecting the protein and amino acid concentrations in milled rice (Yuan et al., 2006). Previous reports have shown that the optimal application of N fertilizer was beneficial for the increment of protein and amino acid concentrations in milled rice (Wang et al., 2001). Here, the application of Si fertilizer also significantly enhanced the protein concentration in milled rice, with increases of 7.29% and 5.08% in 'Shengdao14' and 'Huaidao11', respectively, relative to the control treatment. Similar tendency was observed in brown rice (Figure 3). The application of Si fertilizer markedly increased concentrations of most of the amino acids evaluated in milled rice for both cultivars, including non-essential (Asp, Glu, Ser, Ala, Tyr, Arg and Pro) and essential amino acids (Thr, Ile and Leu). Compared with the control treatment, the concentrations of Asp, Glu, Ser, Ala, Tyr, Arg, Pro, Thr, Ile, and Leu increased on average by 12.00%, 3.55%, 9.15%, 5.06%, 28.77%, 13.24%, 10.83%, 11.50%, 8.82% and 4.75%, respectively, across both cultivars (Tables 4 and 5). The application of Si fertilizer also triggered significant increments in Asp, Glu, Ser, Ala, Tyr, Arg, Pro, Thr, Ile, and Leu contents of brown rice for both cultivars. They were averagely enhanced by 8.46%, 5.18%, 5.63%, 4.02%, 11.91%, 8.79%, 16.24%, 6.35%, 10% and 7.04%, respectively, across both cultivars (Tables 6 and 7). There was nonsignificant effect of the application of Si fertilizer on the Gly, His, Val, Met or Lys concentrations in milled and brown rice. Additionally, there were varietal differences in the responses of the Cys and Phe concentrations to Si fertilizer. Compared with the control treatment, Cys concentration of milled rice increased significantly by 44.44% in 'Shengdao14' but remained unchanged in 'Huaidao11'; in contrast, Phe concentration of milled rice was markedly enhanced by 14.63% in 'Huaidao11' but remained unaffected in 'Shengdao14'. 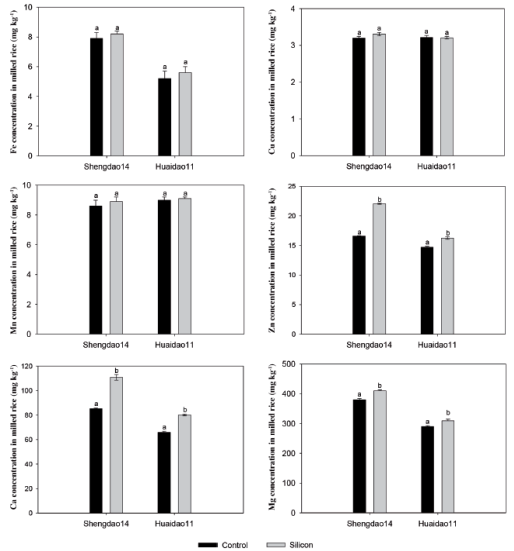 Figure 3: Effect of Si fertilizer on protein concentration in brown and milled rice. Table 4: Effects of Si fertilizer on concentrations of non-essential amino acids in milled rice. Asp: Asparagine, Glu: glutamic acid, Ser: serine, Gly: glycine, Ala: alanine, Cys: cysteine, Tyr: tyrosine, His: histidine, Arg: arginine, Pro: proline. Table 5: Effects of Si fertilizer on concentrations of essential amino acids in milled rice. Thr: Threonine, Val: valine, Met: methionine, Ile: isoleucine, Leu: leucine, Phe: phenylalanine, Lys: lysine. Table 6: Effects of Si fertilizer on concentrations of non-essential amino acids in brown rice. Table 7: Effects of Si fertilizer on concentrations of essential amino acids in brown rice. Our previous research reported that applying Si could significantly enhance rice grain yield (Liu et al., 2016). In general, the increase of grain yield is closely associated with the enhancement of starch accumulation, leading to decreased protein concentration in grain. However, in the present study, applying Si resulted in an increase in protein concentration in grain, which was possibility partly attributed to decreased amylose concentration in grain as reported by Zhang et al. (2007). Additionally, it has been well known that glutamic-pyruvic transaminase is an important enzyme being involved in amino acids and protein synthesis in rice grain (Miflim and Habash, 2002). Some reports demonstrated that the N concentration in rice grains was increased after applying Si, due to the promotion of transportation efficiency of N from leaves to grains induced by the enhancement of the activity of glutamic-pyruvic transaminase in rice leaves (Jiang et al., 2004; Pati et al., 2016). These results better explain the observed increases in most amino acids and protein concentrations in milled rice in the present study. Nevertheless, when compared the control, part amino acids concentration in grain remained unchanged under Si treatment, which still needs further research especially for related mechanism. A 2-yr field experiment was conducted to investigate the effects of Si fertilizer on the mineral elements, protein and amino acids concentrations in brown and milled rice. We observed that, in comparison with control, the application of Si at the rice booting stage increased the Zn, Ca, Mg and protein concentrations and the most of the amino acids concentrations, including Asp, Glu, Ser, Ala, Tyr, Arg, Pro, Thr, Ile and Leu in brown and milled rice. However, Si application did not exhibit effects on the concentrations of Gly, His, Val, Met and Lys in milled rice. Applying Si fertilizer could ameliorate the nutritional quality of rice, which will provide beneficial reference for guiding application of Si fertilizer in high-quality rice production. The research work was financially supported by Innovation project of Vital Applied Agriculture Technology in Shandong.